The backbone of the Mongol army, the Mongol archers were some of the finest to ever handle a bow and arrow. Truly adept at this skill, whether firing off arrows while on a moving horse, or raining down a volley from a standstill the Mongols were fantastic archers. The skills possessed by these Mongol archers was earned over many years. Early usage of the bow and arrow would begin young in a Mongol boys life. The bow and arrow would be used to hunt animals and wildlife, and the legendary leader Genghis Khan himself believed that hunting was a great preparation for war. In this way the young Mongols would learn to draw their bow, to lessen their reaction times and improve their accuracy. The practise of hunting in many ways has parallels with war, and would provide a solid base for learning. Once in the army and a Mongol warrior was part of his Arbatu, a group of ten Mongol warriors, he would have to learn some additional skills. Maybe during the hunt he would have worked as part of a team, but when in his war unit he would need to be much more in tune with the rest of his comrades. It’s thought plenty of training was provided at firing arrows in unison, providing crucial training for when a Mongol would be part of a bigger unit like a Tumen, consisting of 1000 warriors. At this stage the Mongol archers firing in unison would be able to make the sky rain with arrows and strike fear and panic into the hearts of their foes. Of course an archer is nothing without the right equipment and the Mongols has bespoke bows and arrows that were suited to their build and size. Essential to every archer was the bow, and the Mongol warriors were masters of it. The particular bow used by the Mongols was a composite bow, which means the bow is constructed from multiple materials which are combined together to form one solid piece. The Mongol version was traditionally created from three materials, animal horn, wood and some sinew for the bow drawstring. The Mongol bow was ideal for horse riders, the composite construction mean’t that the bow was as powerful as larger single piece wood bows, but much much smaller. Of course constructing a composite bow was much more time consuming, but for a warrior so reliant on their bow, the Mongol archer likely saw the creation of a bow as a very zen experience. 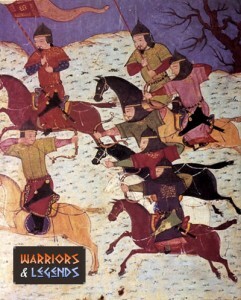 A collection of Mongol archers on horseback. One interesting not about the Mongol bow is that even though it was much smaller than a bow like an English longbow, it was much more powerful. This power was generated from the composite material, that unstrung would bow the other way than when strung, demonstrating the great pressure contained within this particular bow. Of course arrows are crucial for any marksman, and the Mongols took great pride in their arrows. Its thought that a horseback mounted warrior would carry not one, not two, but three arrow quivers, and all of these quivers were important for different uses. the first quiver would contain the standard arrows, suitable for non armoured opponents. the second quiver would contain the more damaging armour piercing arrows headed, which were constructed with tempered metal to allow for better penetration. The third and final quiver was thought to be the specialist arrows, flaming arrows and signal arrows, which including message arrows and whistling arrows useful for many purposes. It’s often reported that the Mongol warriors rode ponies rather than horses. This may have been true in some circumstances, but the reality is the the Mongols did mostly ride horses. the reason that many thought they were ponies was because of small stature of the Mongolian Horse. This breed of horse is very unique, its a very short horse, with a normal sized body and short legs. The hooves of this horse are strong and sturdy from its years of surviving outdoors in varying environments, and its footing was true even over tough terrain. The Mongol horse would have provided the idea base for the Mongol warrior archer, with a lower centre of gravity that a normal horse a rider would have been able to shift their bodyweight easily on this steed. Adept in any situation, the Mongol archer was capable of shooting arrows on foot or horseback. Additionally the archers were capable of working either alone or in a unit of 10 to 10,000 warriors, to the Mongol archer it made little difference they were still confident in their bows and arrows.